I had really planned to show you our family room, kitchen and breakfast room as part of this house tour but of course my camera is on the fritz. 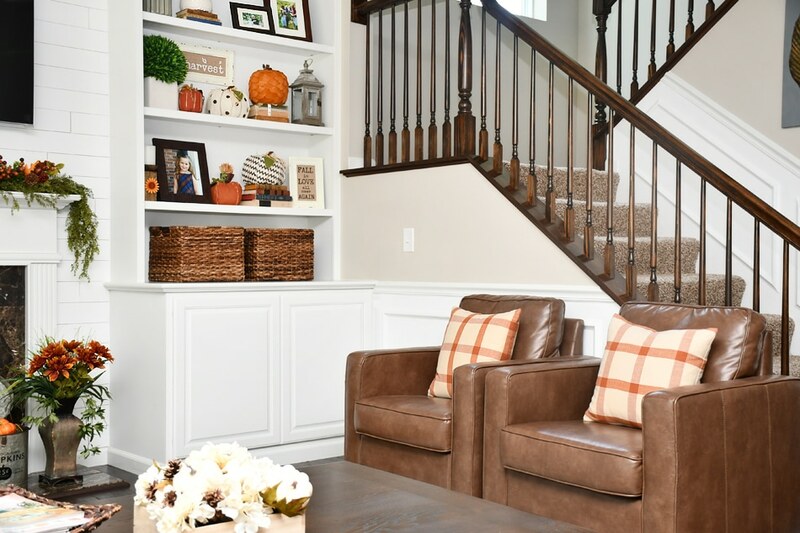 So I guess you’ll have to wait for the rest of our home but at least we can start with my favorite part of our fall house tour… the family room! 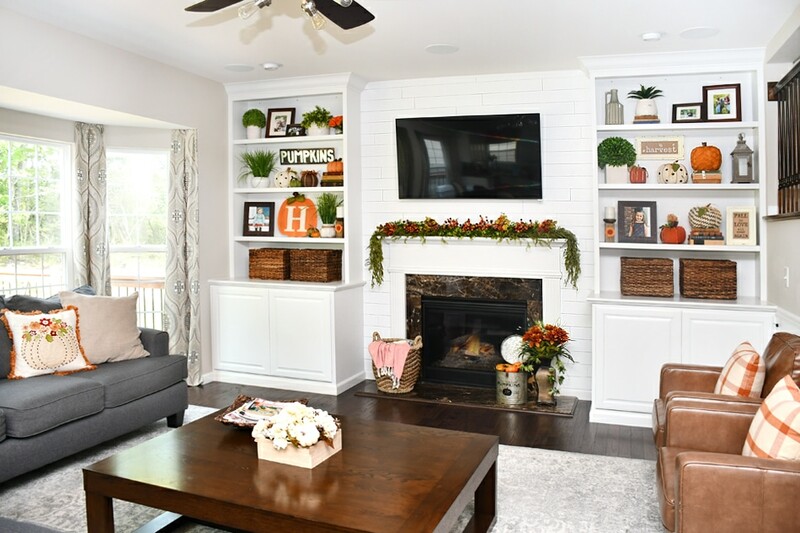 The best part about decorating our family room is working around the built ins. 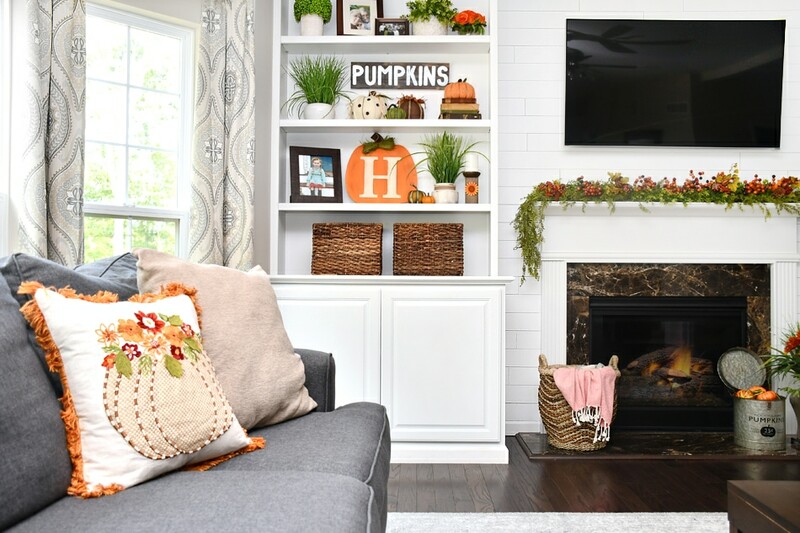 You might spy the pumpkin monogram I made last year on one of the shelves… seriously one of my favorite fall crafts ever! 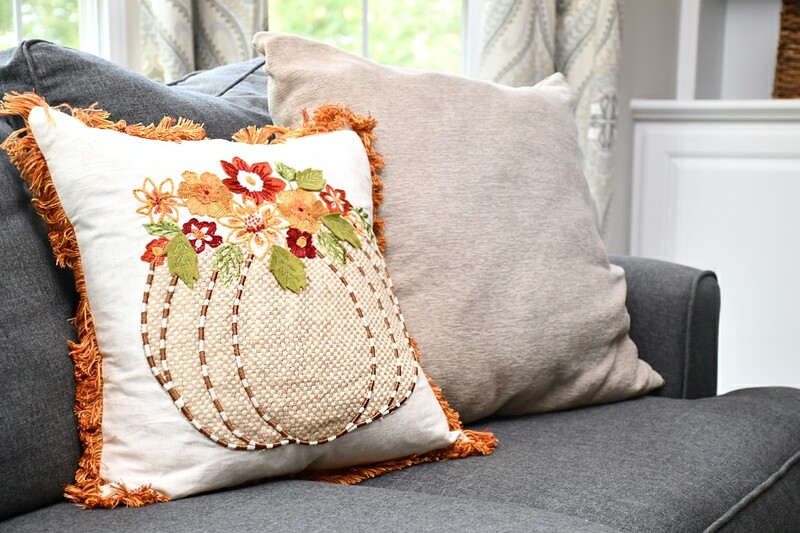 Throughout the family room kept a lot of the same décor from last year with just a few additions like the new accent pillow from HomeGoods. I love the bright colors and details on it. 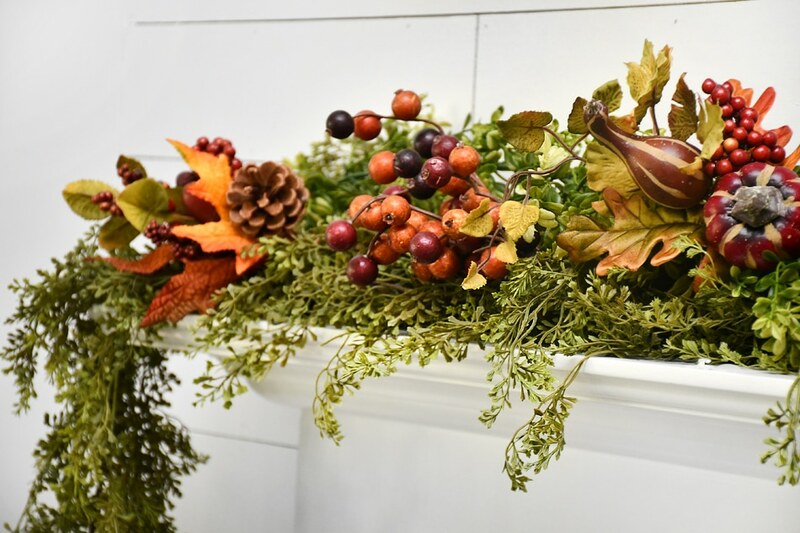 For the fireplace mantel I just kept up the normal greenery garland that I use all year long; I just tuck in some Fall picks from Hobby Lobby in a couple places. Easy and affordable update. 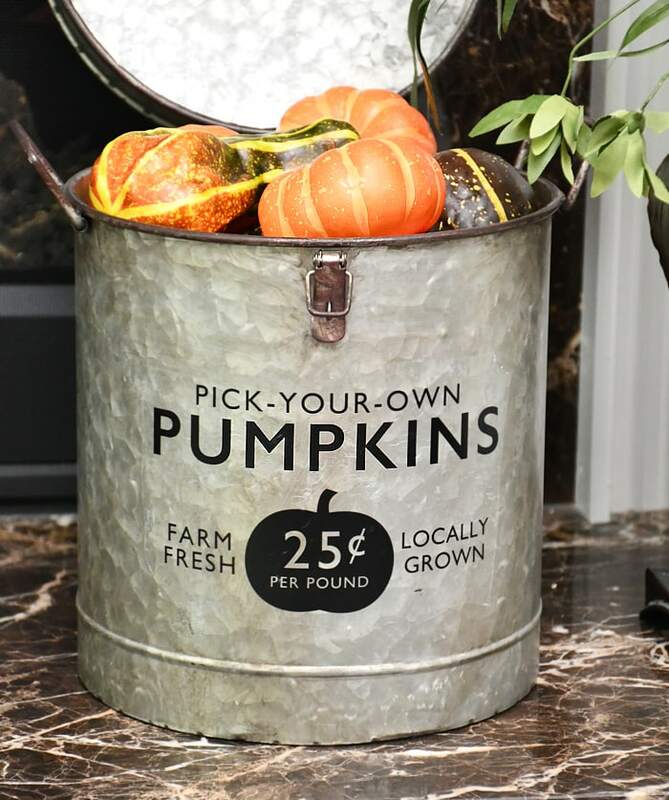 On the fireplace hearth I added the new farmhouse pumpkin bucket I made last week. If you missed that tutorial make sure you check it out. SO EASY to make! The two leather chairs from Target got some adorable orange and cream buffalo check pillows. You know I’m totally digging buffalo check these days with my recent black and white buffalo check pumpkin wreath. 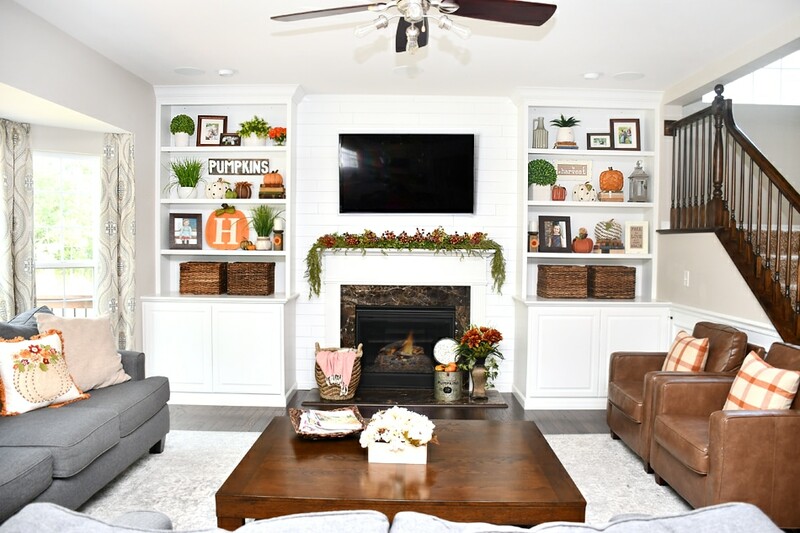 Overall just little pops of pumpkins is what makes this room come to life for the season. The polka dot and chevron burlap pumpkins were purchased from Gordman’s last Fall and a lot of other ones I’ve just accumulated over the years. Yes, I’m a pumpkin hoarder. 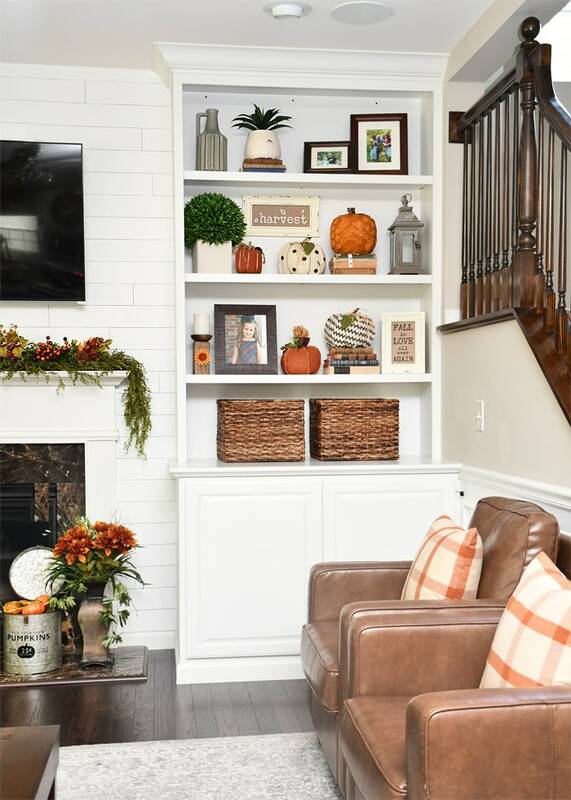 That’s it for the family room Fall house tour. Hopefully I’ll get my camera back on track so I can show you guys the kitchen and breakfast room. Totally LOVING my kitchen this year and hope you do too. Stay tuned! Very cute! You are a pumpkin hoarder! Love it!